One source considers "Bediya" to be the generic name of a number of vagrant, nomadic groups. Traditionally, a large section of the Bedia were reported to be earning a livelihood from prostitution and dancing, however, this has largely been discontinued. The Bedia worship deities like Thakur, Shiva, Parvati, Hanuman, Chamunda, Kali and Sitala and Khermata (a local deity). Giving up allegiance to personal deities may be threatening. Pray for the Bedia people to be delivered from their fear of "Christendom" and to embrace God's blessing through his Word for their families and clans. Pray the few followers of Jesus among the Bedia will have pastors and teachers to help them grow to become faithful disciples. Pray they will be taught accurately and well. 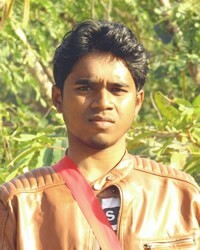 Pray the Bedia will make schooling a priority for their children, and will be able to improve their standard of living. 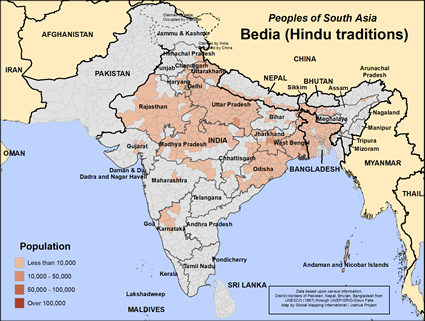 View Bedia (Hindu traditions) in all countries.